1. Swapnali Yadav (born 1998) is a Yadav girl who became the youngest-ever to win the women's category in the Kimberley National Lake Argyle Swim in Kununurra, Western Australia. 3. Swapnali did her schooling from Bombay Cambridge School, Andheri. 4. Swapnali has trained for swimming under coaches Satish Solanki and Sandip Newalkar. 5. Swapnali has trained for cycling under Rajendra Soni. 6. Swapnali has trained for running under coach Ravi Bagdi. 7. Besides being the youngest, she is also the first Indian to win the Kimberley National Lake Argyle Swim. 8. She has been given the title of 'Little Mermaid' in the world of swimming. 1. Swapnali Yadav had won the first Kimberley National Lake Argyle Swim that was held on April 30 in Australia's second-biggest artificial lake. 2. Swapnali was a special invitee for the 20 km Open swim in the 80 km picturesque lake, which is infested by about 35,000 crocodiles. She took 7 hours, 7 minutes and 24 seconds to finish overall second. 3. The feat also earned her a place in the Limca Book of Records. 4. She is being trained by Raju Palkar. 5. She also won the 10-mile course for female youth (under-18) at the prestigious Kingdom Aquafest that was held on the shores of Lake Memphremagog, in the heart of Northeast Kingdom, Newport, Vermont, USA on Saturday, July 24. 6. She added the Kingdom Aquafest effort to the outstanding performances as the youngest-ever in the world in the 2007 Open World Swimming Marathon and the 30 km Messinikos Gulf Swim in 2008-09, both in Greece, and the 2009 Bermuda Round the Sound Open Swimathon, to announce her arrival in international swimming. 7. In 2012, Swapnali won the silver medal in the Junior International Triathlon held in Malaysia. 8. 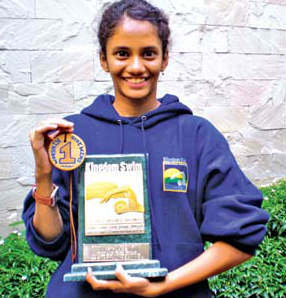 Since 2009 Swapnali has won the state under-18 Aquathon and Triathlon gold and in November last year she added another gold in Aquathon and silver in Triathlon at the nationals in Raipur. 9. In addition, Swapnali won silver at the national level and gold at the state level in road race cycling and finished fourth in this year's 10km Open Woman's Marathon. She is a SuperGirl !